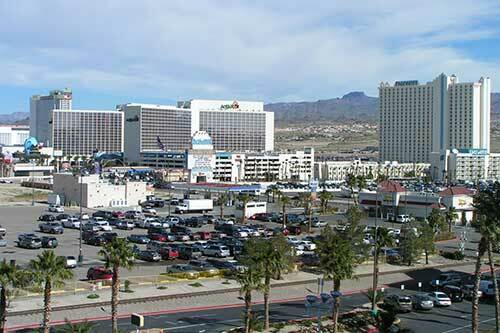 Laughlin is purely for fun — no-one goes there for business unless they are in the fun business. It’s a miniature Las Vegas — resorts instead of megaresorts — all the luxury and razzamataz of the big casino hotels without the traffic jams. sleek boats, sending up rooster-tails, the Little Belle and the USS Riverside gliding grandly past on sight-seeing cruises with fishermen on the shore. gambling operations grossed more than $20 million. 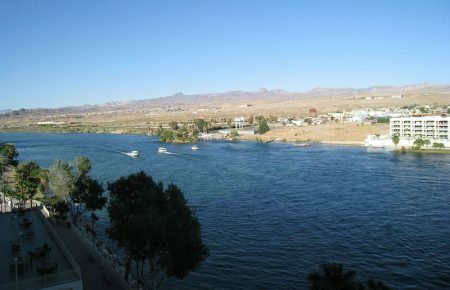 But that was deep in the ancient past as time as measured in Laughlin. A succession of residential projects began with Laughlin’s first house in 1985, and now Laughlin has more than 7,500 residents of its own. Area and the long, skinny Emerald River Golf Course. Looming like a ghost above the sparkling water like a haunting monument to greed and bad judgment: the skeleton of the 4,000-room Emerald River Casino Hotel, financed with junk bonds and abandoned before completion. Turn right at the Needles Highway to tour the residential part of town and return to the casinos. The countryside around Laughlin is inviting to the backroad explorer; temperatures are most comfortable from late fall through early spring, and in March and April the wildflowers make a brilliant display. 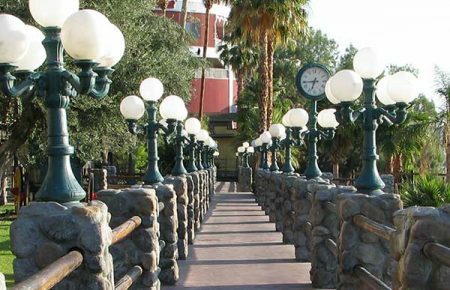 But even if you’re not an outdoorsman, even if you are blase about gambling and entertainment, visit Laughlin just because it is such an incredible phenomenon, a brilliant boomtown in the great Nevada tradition. Wretched excess? Of course; it’s a specialty here. But would you rather have a rundown motel and a bait shack with a beer cooler?